The streaming company says it won't be involved with any production of "House of Cards" that includes Spacey. Netflix is done working with Kevin Spacey following a string of sexual misconduct allegations. In a statement, the streaming service said it "will not be involved with any further production of 'House of Cards' that includes Kevin Spacey." It also said it won't move forward with the release of a film starring Spacey as author Gore Vidal. In a Buzzfeed interview published last month, fellow actor Anthony Rapp accused Spacey of making a sexual advance toward him when Rapp was 14 years old. Spacey would have been 26. After that, a slew of others accused Spacey of sexual misconduct, including staffers on "House of Cards." Many remained anonymous. Netflix suspended production of the final season of its hit show amid reports of the allegations. Spacey's talent agency and publicist also dropped him. 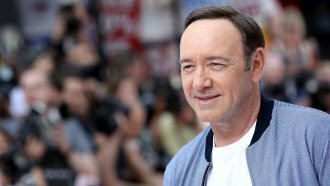 Spacey is reportedly seeking treatment. Netflix says it will still work with TV studio Media Rights Capital to figure out a way forward regarding "House of Cards."